The Hillsound Trail Crampon is a necessity for added traction when out hiking on the local trails in the back-country. Tested on the trails of the Himalayas, the Hillsound Trail Crampon is guaranteed to handle diverse winter terrain and weather conditions.Utilizing an ergonomic plate system, this crampon provides excellent traction and reduces muscular fatigue for your winter wilderness pursuits. Made of ultra high-strength stainless steel for durability and weight reduction, the new Trail Crampon ULTRA brings the Trail Crampon's legacy of superb traction performance to those needing to travel faster and lighter. 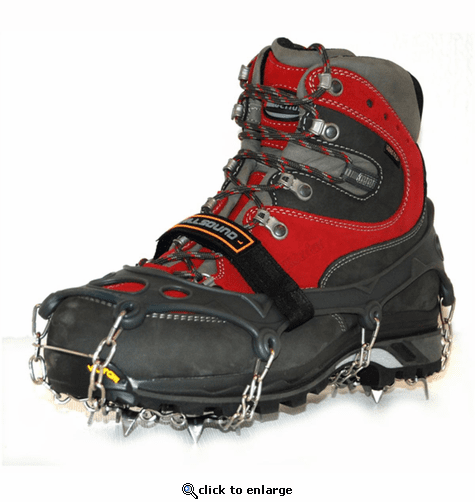 18 spikes offer aggressive traction on any icy surface and distributes pressure to withstand wear. Welded chains withstand repeated torque, foot strikes and abuse on any ice and snow. Double-sided chains keep a tight grip on shoes to prevent shifting of traction device. Larger heel plate gives secure traction and ultra stability for descents and trail-running. Hillsound crampons have a 2-year warranty against damage due to poor workmanship and/or defective materials excluding normal wear and tear, oxidation, alterations and modifications, damage by mechanical force, improper storage and maintenance and uses for which this product is not designed. In the event that the Hillsound product does not perform as listed, the user shall notify Hillsound of any such defect within 90 calendar days from the date when the defect was observed. The user's sole and exclusive remedy shall be limited to the correction of the defect by adjustment, repair, replacement or refund, which shall be at Hillsound's election.